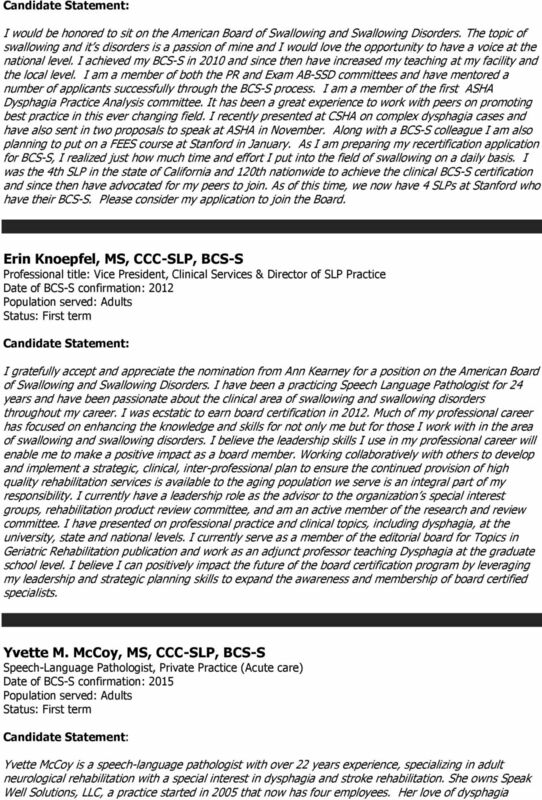 Download "AB-SSD Slate of Candidates 2015"
1 AB-SSD Slate of Candidates 2015 Joan Kelly Arsenault, MA, CCC/SLP, BCS-S CEO//Managing Partner MassTex Imaging, LLC Date of BCS-S confirmation: 2012 Population served: Adult & Pediatrics I have dedicated most of my career to the diagnosis and treatment of dysphagia. I strongly believe in the BCS-S and immediately after obtaining my certification I became a BCS-S mentor and my company became a corporate sponsor. Two of my mentees have successfully obtained their BCS-S, one of which is my employee. I am currently encouraging two more employees to consider this certification. I specialize in Mobile MBSS, one of a handful across the country. My company prides itself on providing the highest quality of services by remaining current in the field and utilizing evidenced based data to drive our diagnostic and treatment recommendations. Educating our referral sources and patients regarding swallowing/swallowing disorders is paramount to our practice. Recently I had the privilege of serving on the AB-SSD Practice Analysis Committee. That time spent with colleagues made me realize I would like to serve on the AB-SSD board. I have worked in a variety of settings across my career (acute care, SNF, home care, Pediatric Rehab Center, NICU, private practice) as well as taught at the graduate level. I have a good breadth of clinical, teaching and administrative skills which I feel would be an asset to the board. Thank you for your consideration. Karen Ball, MPA, MS, CCC-SLP, BCS-S CUNY Queens College & Mt. Sinai Beth Israel Date of BCS-S confirmation: 2009 Population served: Adult I have been full time faculty at CUNY Queens College for 8 years teaching in the undergraduate and graduate programs. I teach the graduate dysphagia class and have been doing so since 2002 (adjunct lecturer 5 years before being hired full time). I also teach undergrad Anatomy and Speech Disorders Classes. Before entering academia, I was a full time medical speech pathologist in teaching hospitals in Boston and New York. I have been working in the field of Dysphagia for over 20 years and consider it a passion. I find working with patients with dysphagia both challenging and rewarding and I make every effort to keep up to date with the most current research to be sure to provide my students with the latest, evidenced based practice techniques. In addition I continue to treat and advocate for patients presenting with swallowing disorders in a certified ALS clinic as well as in private practice. Following my receipt of Board Certification, I decided to explore opportunities to serve and give back to the swallowing community. I served briefly on the executive board for the ABSSD. I continue to serve on the Admissions Committee of the ABSSD and am a member of the ABSSD Practice Analysis Task Force. For the past year I have also been a member of the SIG 13 Perspectives editorial board. Being a part of these committees is extremely rewarding and I would like to continue my service and contributions by being elected to the ABSSD. 5 organizational skills, listening skills, and am comfortable working with others to collaborate. Finally, I am willing to commit my time and efforts to complete the tasks necessary to fulfill the position. Thank you for your consideration. 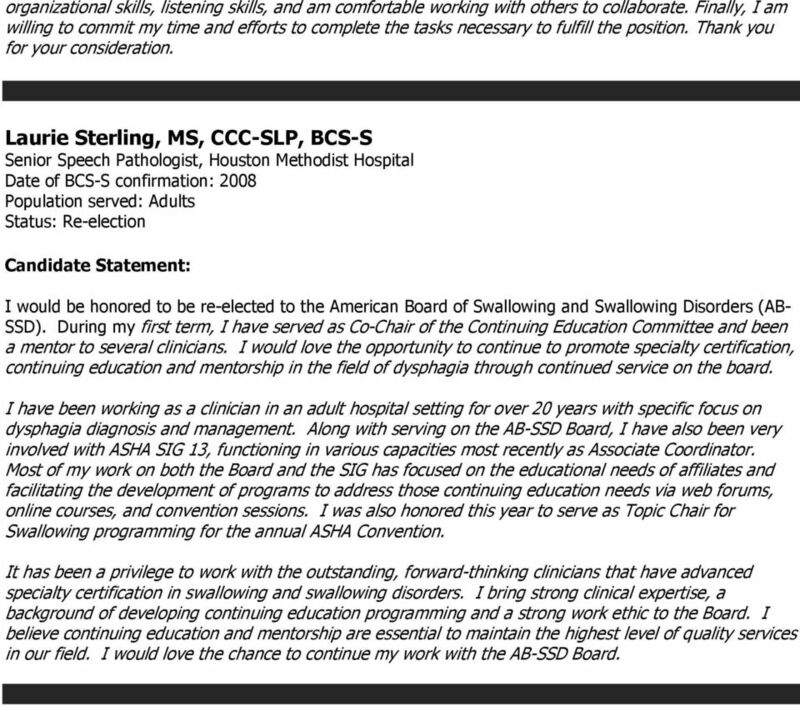 Laurie Sterling, MS, CCC-SLP, BCS-S Senior Speech Pathologist, Houston Methodist Hospital Date of BCS-S confirmation: 2008 I would be honored to be re-elected to the American Board of Swallowing and Swallowing Disorders (AB- SSD). During my first term, I have served as Co-Chair of the Continuing Education Committee and been a mentor to several clinicians. I would love the opportunity to continue to promote specialty certification, continuing education and mentorship in the field of dysphagia through continued service on the board. I have been working as a clinician in an adult hospital setting for over 20 years with specific focus on dysphagia diagnosis and management. Along with serving on the AB-SSD Board, I have also been very involved with ASHA SIG 13, functioning in various capacities most recently as Associate Coordinator. Most of my work on both the Board and the SIG has focused on the educational needs of affiliates and facilitating the development of programs to address those continuing education needs via web forums, online courses, and convention sessions. I was also honored this year to serve as Topic Chair for Swallowing programming for the annual ASHA Convention. It has been a privilege to work with the outstanding, forward-thinking clinicians that have advanced specialty certification in swallowing and swallowing disorders. I bring strong clinical expertise, a background of developing continuing education programming and a strong work ethic to the Board. I believe continuing education and mentorship are essential to maintain the highest level of quality services in our field. 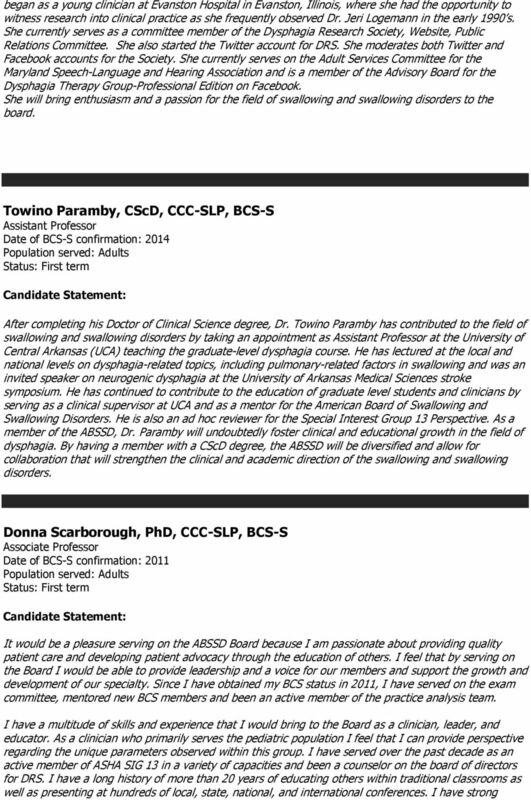 I would love the chance to continue my work with the AB-SSD Board. What do you see as the priorities of the Nominating Committee in selecting the future leaders of our Academy? THE BEST ALLIED HEALTH CAREERS BEGIN WITH A B.S. IN HEALTH SCIENCES. Meet our Lead Instructor Trainers!